This Belgian floral tapestry "Oval Still Life Beige" shows a bouquet of flowers with an elaborate floral motif border. Tapestries from Belgium has used floral still life as decor for palaces for centuries, and here we see an elegant display of blooms on a table, surrounded by an ornate border in oval shape, created out of floral motifs. 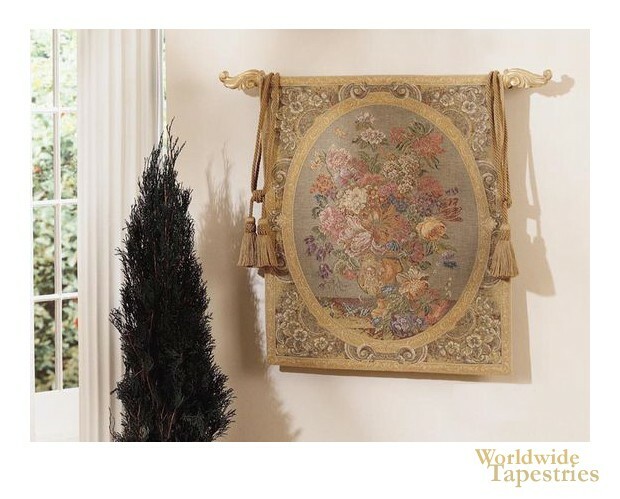 This Belgian tapestry "Oval Still Life Beige" is backed with a lining and has a tunnel for easy hanging. Note: tapestry rod and tassels, where pictured, are not included in the price.